Robin Williams’ custom bike has been auctioned off to benefit college scholarships for underprivileged students. 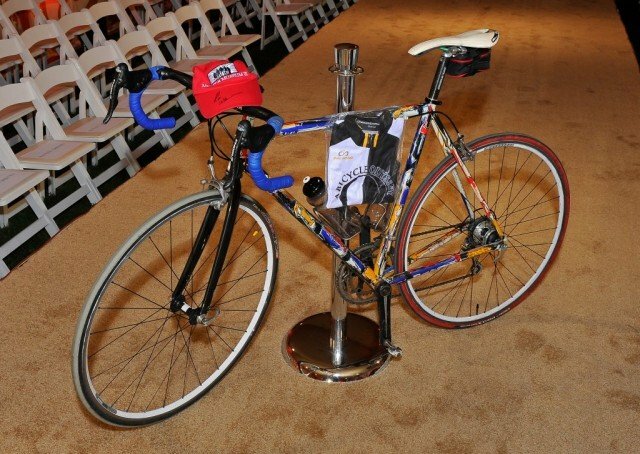 Robin Williams, a keen cyclist, donated his handmade Pegoretti bike and an autographed Night at the Museum hat to the Hotbed benefit for the 10,000 Degrees organization shortly before his death on August 11. Several weeks before his death, Robin Williams donated his Pegoretti bicycle to the Drever Family Foundation’s annual Hotbed benefit in Tiburon, California, which took place on August 23. The comedian was a close friend of Jan and Maxwell Drever and their family and was planning to attend the gala before his suicide two weeks ago. He also helped organize the Moroccan themed event, according to the New York Daily News. Robin Williams’ bike fetched $20,000 at the auction, which will fund a year of higher education for two students.